Summary:Tranen prepared and then implmented a Revegetation Plan for a site in Helena Valley containing a creek, floodplain, and upland areas. 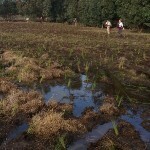 48,000 seedlings were planted over two years and direct seeding was also undertaken initially. Project successfully completed on time and 5% under budget. In March 2010 Tranen was commissioned to prepare a Revegetation Plan for the Public Open Space (POS) at lot 206 Helena Valley Road, Helena Valley. This plan was written with the objective of reinstating the degraded POS to protect and enhance the scattered remnant vegetation. 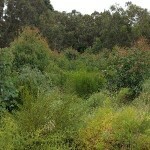 In 2011 Tranen was awarded with the implementation of the plan, and revegetation activities began in 2012. Upland zone – dry zone elevated above the floodplain as indicated by variation in remnant species. There was a high cover of weed grasses. Risk of soil erosion was high. Kangaroos were active within and around the site. Tranen prepared a unique management strategy for each vegetation zone. Thorough weed control was conducted prior to the beginning of revegetation work, commencing with scalping of the surface to 100 mm after herbicide application to remove dead vegetation and weed seed contained in the topsoil. Native plants were established at high density to replace the function of weeds in erosion control. Careful consideration was taken with species selection to minimize fuel load and the risk of fire in the nearby housing development. Tree guards were installed in order to minimise the opportunity for kangaroo grazing and to facilitate seedling establishment. 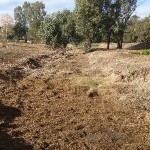 The completion criteria were met and the project successfully handed over, with the Kardina Brook revegetation exceeding plant density targets. The POS is now contributing to the healthy functioning of the local ecosystem. The project was completed on time and 5% under budget.